Guggenheim, the eighth-largest U.S. ETF issuer, plans to lower fees on its nine equal-weight sector ETFs, according to a regulatory filing. “At a meeting held on November 14, 2013, at the recommendation of Security Investors, LLC (the “Advisor”), the investment adviser to the Funds, the Board of Trustees (the “Board”) of Rydex ETF Trust (the “Trust”), including a majority of the Independent Trustees, approved a reduction in the advisory fee paid by the Funds to the Advisor from 0.50% to 0.40%,” according to the filing. The new expense ratios will go into effect Dec. 1. 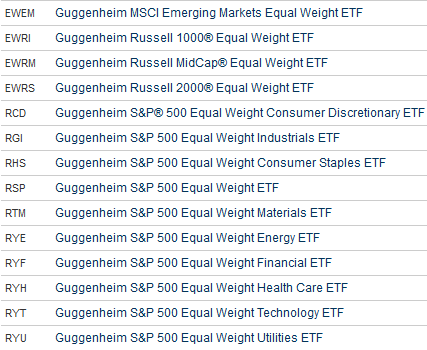 Among the nine Guggenheim equal-weight sector funds that will see lower expenses are the $134.4 million Guggenheim S&P Equal Weight Healthcare ETF (NYSEArca: RYH) and the $291.3 million Guggenheim S&P Equal Weight Technology ETF (NYSEArca: RYT).